South Gallia sophomore Jacob Birtcher, top, gains leverage on Gallia Academy’s Tristin Crisenbery during a 138-pound match on Wednesday night at Gallia Academy High School in Centenary, Ohio. CENTENARY, Ohio — The hosts proved they had the most. 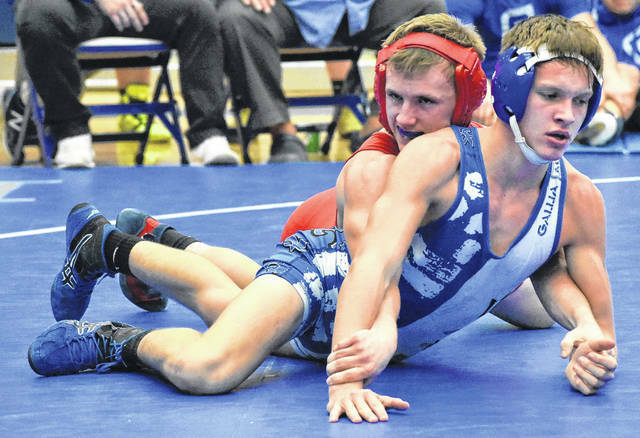 The wrestling teams from Gallia Academy, River Valley and South Gallia all took part in the 2018 Gallia County tri-match held Wednesday at Gallia Academy High School. The Blue Devils proved victorious overall on the night, as they downed the Rebels by a score of 63-18 and the Raiders by a final of 56-22. GAHS earned a combined total of 22 individual victories to just six losses, with four wins coming as a result of pinfall. Jason Stroud (106), Caleb Greenlee (113), Kyle Greenlee (120), Justin Day (132), Tristin Crisenbery (138), Bronson Carter (145) Logan Griffith (220) and Hunter Terry (285) each finished the night with 2-0 marks in their matches. Griffith, Carter and Terry each earned a pinfall victory. Grant Bryan (126), Trentin Waller (152) and Kenny Siders (170) each ended the event going 1-1 overall. Nick Hufford (195) and Boo Pullins (195) both picked up wins in their lone matches as well. RVHS had four grapplers end the night with records of 2-0 in individual competition in the form of Coalton Burns (126), Nathan Michael (170), Derek Johnson (182) and Eric Weber (160). Michael earned both of his wins by way of pinfall as he helped the Raiders accumulate four pinfall wins as a team. Five other Raiders wrestlers picked up individual victories as Joseph Burns (113), Jacob Edwards (120), KC Collins (195), Ryan Weber (220) and Dakota Doss (285) helped guide River Valley to a 51-12 win over South Gallia. SGHS, despite dropping both team events, ended the night with victories by Justin Butler (152), Svlatoslav Hryherenko (160), Chad Bostic (170) and Alex Peck (145). Butler went 2-0 with one pinfall victory at 152 pounds. Gallia Academy next travels to Mt. Orab, Ohio, to face Western Brown on Saturday. River Valley is scheduled to participate at the WSAZ Invitational at Big Sandy Superstore Arena in Huntington on Friday, Jan. 19. The South Gallia Rebels wrestling team will next take to the mat on Wednesday when they travel to Eastern.